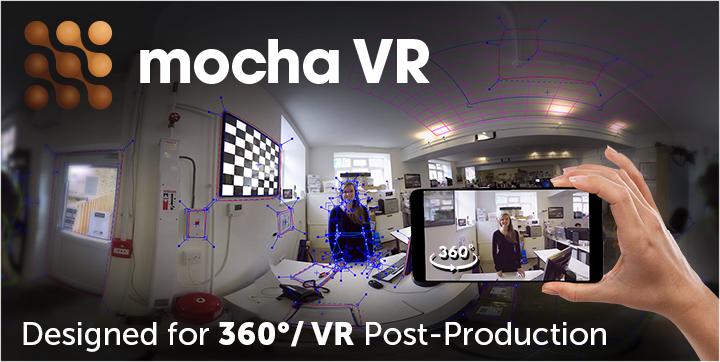 Mocha VR brings native 360° optimized tools to Adobe Premiere Pro CC, Adobe After Effects CC, Avid Media Composer, The Foundry’s NUKE, and Blackmagic Design Fusion. Never leave your timeline! Buy now. ● Learn more. ● Download a free trial. 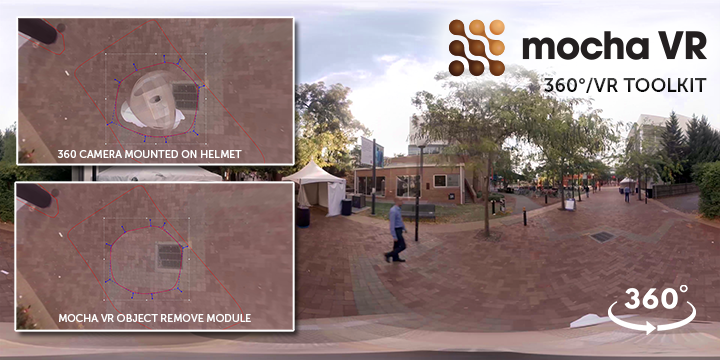 360° Planar Tracking: Imagineer’s award-winning planar tracking solution now supports equirectangular footage delivering the world’s most robust 360° tracking solution for post-production. 360° Workspace: Optimized workspace and toolset works simultaneously in rectilinear and lat/long views bringing 360° capability to a variety of applications. Editors and artists can easily track, roto, create effects and insert graphics without worrying about equirectangular seams or distorted pixels. 360° Masking Tools: Unlimited X-Spline tools for articulate shape creation and masking, saves hours of time versus traditional keyframing techniques. Roto-masks can be rendered back to host or exported to most editing and compositing systems. 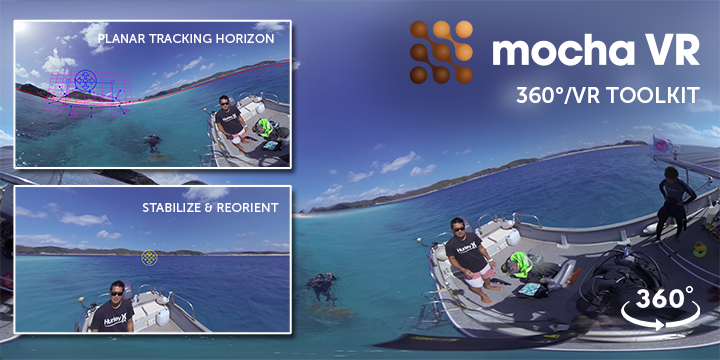 360° Object Removal: Mocha’s famous Remove Module now works on 360° video by analyzing temporal frames and removing unwanted camera rigs, shadows, crew members and more for massive time-savings. Horizon Stabilization: Designed to reduce unstable motion, the new Reorient Module can drastically improve nausea-inducing VR experiences by smoothing or stabilizing shaky, handheld and drone captured footage. Driven by robust planar tracking, a user can even track and stabilize difficult and out of focus footage. 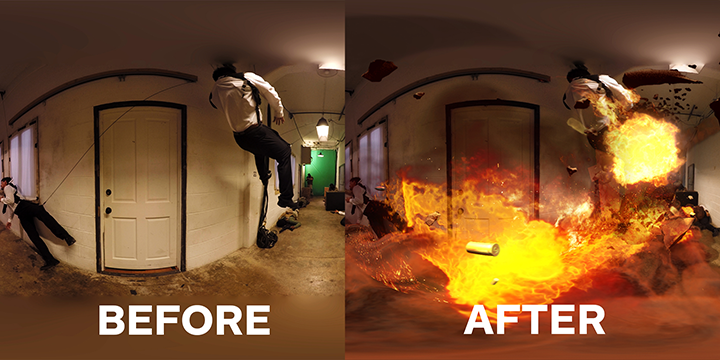 Lens Distort Workflow for 360° Compositing: Plug-in based lens correction workflow converts between lat/long and rectilinear for a simple workflow to add titles, graphics, patches and non-360 enabled filters to your 360 project. Plug-in & Standalone Workflows: Running as a plug-in inside industry standard editing and effects applications Adobe Premiere Pro CC, After Effects CC, Avid Media Composer and Nuke provides an immediate and accessible workflow for 360/VR post tasks. Render finished shots to your timeline OR export tracking and roto data in a variety of formats for flexibility and project sharing. “Mocha VR was crucial in executing the tracking and object removal on our VR/360 action series Augmented.” – Blair Kelly, IGN. Floating licenses for enterprise customers are available with a minimum requirement of 5 seats. Please contact sales with questions. Compatibility: Windows, OS-X and Linux. Plug-in support for Adobe After Effects and Premiere Pro CC 2017, Avid Media Composer and OFX hosts: The Foundry’s NUKE and Blackmagic Design Fusion.